National Eosinophil Awareness Week 2017 is a special opportunity for businesses and organizations to show their support for those living with eosinophil-associated diseases. We’re grateful to the following Partners that have pledged to help APFED increase awareness and education during the week of May 14-20. How will your organization recognize National Eosinophil Awareness Week? Promotion through a weekly newsletter to all employees. Advertising the week through television screens throughout the hospital and elevator postings. How will your organization recognize National Eosinophil Awareness Week? We have mentioned it in our newsletter, and we will also mention it during the week on all our social media pages. How will your organization recognize National Eosinophil Awareness Week? Communicating about EADs and APFED during the National Eosinophil Awareness Week, as well as promoting the 2017 Eos Connections conference and Dr. Bhullar’s participation. How will your organization recognize National Eosinophil Awareness Week? Education of medical professionals and the general public in the UK. Members are holding awareness events around the country and giving talks in school to educate their teachers and fellow pupils. Use of social media to promote awareness. How will your organization recognize National Eosinophil Awareness Week? IFFGD pledges to help raise awareness about eosinophil-mediated disorders, especially those affecting gastrointestinal function, during the 2017 National Eosinophil Awareness Week. We will share information regarding these conditions using social media to reach our audience, which primarily consists of people interested in digestive conditions. How will your organization recognize National Eosinophil Awareness Week? Leading up to National Eosinophil Awareness Week, we are distributing upcoming or in-progress studies and current research to all of our members and all patients at the Mt. 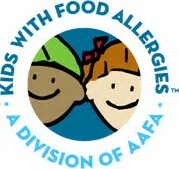 Sinai Hospital – Jaffe Food Allergy Institute – Eosinophilic Disorders Program. We will also be hosting a Eosinophilic Support Group during the week on May 18th at Mt. Sinai, moderated by Amy Jo Frischling and Dr. Mirna Chehade, who will be available to answer questions of attendees. How will your organization recognize National Eosinophil Awareness Week? 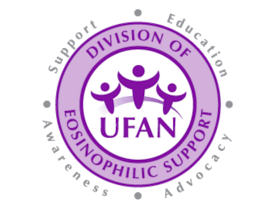 UFAN just finished its Annual Patient Education Conference with topics and speakers directly related to eosinophilic disorders, including research updates, physicians from the Food allergy Eosinophilic Clinic (FED clinic), dealing with anxiety, feeding issues, restricted diets, etc. Utah House Bill 400 regarding formula coverage recently passed, and we are working to spread the word so eligible families can access coverage. We have partnered with a local physician, working on EGID research and a social/emotional impact of EIGDs questionnaire. We are in the planning stages of a fundraiser in the fall. During NEAW, we plan on holding an advocacy/support meeting with guest speakers. We also plan to contact our local news stations/newspapers to help spread the word about eosinophilic disorders and highlight some amazing families living with EGIDs. Special thanks to our education partners for supporting APFED’s NEAW celebration this year! By signing up and showing your support, you can share why NEAW is important to you. If your company or organization is interested in partnering for NEAW 2017, please click here.